Who were the winners at UFC 198: Werdum vs Miocic? Click below to get the results for all the fights at Arena Atletico Paranaense in Curitiba, Brazil on Saturday, May 14, 2016. With one punch Stipe Miocic became the new heavyweight champion after knocking out Fabricio Werdum in front of 45,000 of his fellow countrymen at 2:47 of the first round. Miocic was backpedaling as Werdum came charging forward looking for a combo, but he walked into an on target counter right that ended the fight on the spot. Miocic is the 15th UFC champion in history. 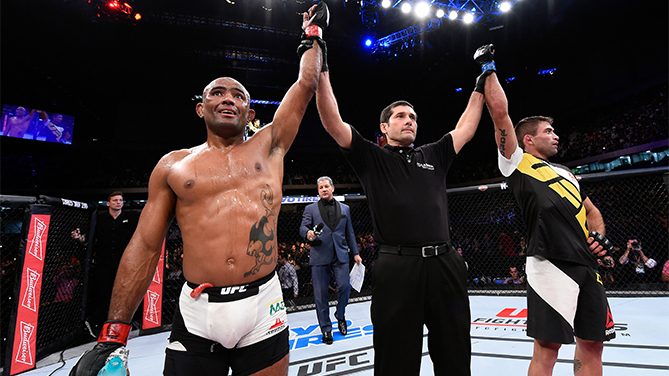 The plan was likely always to get the fight to the ground, and Jacare Souza wasted no time implementing his gameplan. He got top position and eventually mount and finished Vitor Belfort by TKO at 4:38 of the first round. Souza looked to be the more physical fighter and he used his two takedowns to land 43 significant strikes and Belfort’s face showed the results of the strikes when it was over. In just over a minute, Cris Cyborg dropped Leslie Smith and then pounced with a heavy swarm of punches before the ref had to call it at 1:21 of the very first round. 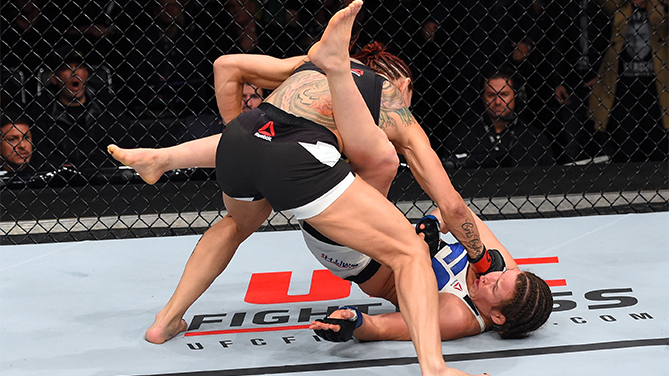 It was a left-right combo that dropped Smith before Cyborg just unloaded with a final tally of 25 significant strikes. In a very close split decision, Shogun Rua edged Corey Anderson by a score of 28-29, 29-28, 29-28. Shogun almost finished Anderson in the first round with a nice hook, but Anderson was saved by the horn. 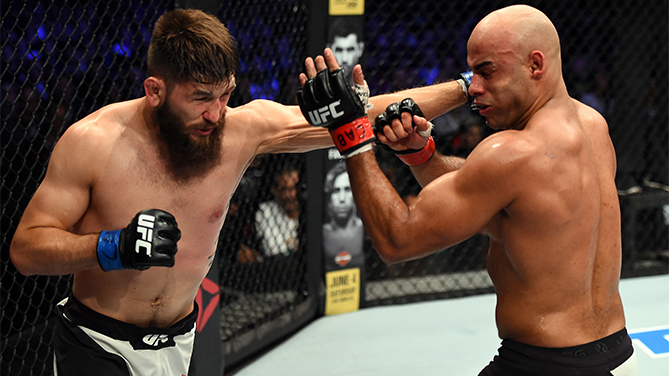 Bryan Barberena continues his winning way against unbeaten prospects as he takes out Warlley Alves by unanimous decision (29-28x3). Barberena really pushed the pace in the third round, landing almost triple the significant strikes compared to Alves, who almost submitted Barberena in the first round. It was virtually 15 minutes of Demian Maia mauling Matt Brown on the ground before the tough “Immortal” one was forced to tap out due to a rear naked choke at 4:31 of the third round. Maia landed takedown after takedown and used a body lock to take the fight out of Brown, who did offer an early third round flurry. But in the end the Brazilian was too much. It only took Thiago Santos 3:39 to finish Nate Marquardt in the first round with a heavy barrage of punches. It was a straight left that started the onslaught from Santos, who knew he had Marquardt buckled and capitalized. That’s 4 straight wins for Santos, which is good for the 3rd longest active win streak in the middleweight division. In what is a leading candidate for fight of the night, Francisco Trinaldo was outstanding against Yancy Medeiros, landing 110 total significant strikes en route to a unanimous decision win, 29-26, 30-27, 30-26. Trinaldo has now won six in a row. John Lineker isn’t called “Hands of Stone” for nothing. 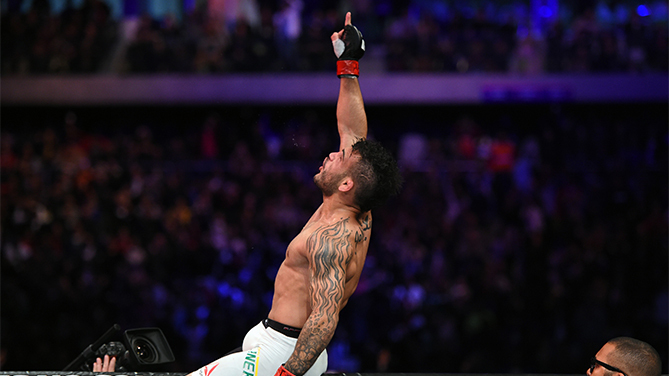 The former flyweight brought the power against Rob Font and earned the unanimous decision win (30-27, 29-28, 30-26). Lineker knocked Font down twice in the fight and almost finished late in the third round after a combo dropped Font. Lineker out-landed Font in sign. Strikes, 80-42. With his entire country watching, Antonio Rogerio Nogueira delivered perhaps his most amazing UFC performance to date, knocking out Patrick Cummins standing in the first round with seconds remaining before the horn. He landed a perfect right hook to stun Cummins and then went on the attack, landing a total of 41 significant strikes before the ref finally stepped in to stop the fight. Luan Chagas came out guns blazing against Sergio Moraes early in their UFC FIGHT PASS bout, and landed some big blows in the opening round. 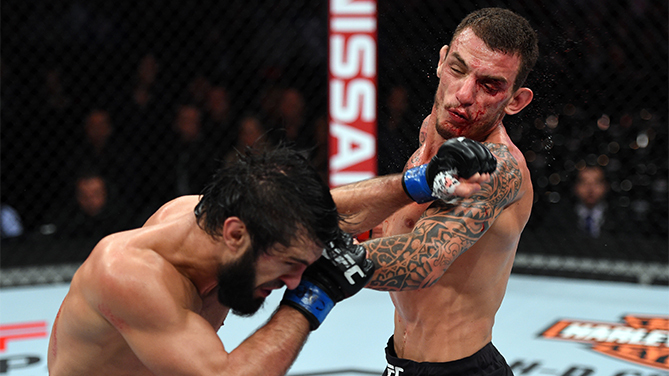 But the veteran Moraes weathered the storm and used his ground game to stifle Chagas in the final two rounds. In the end, the result was a split draw as the third judge scored the fight 28-28 after each fighter got the win 29-28 by one of the first two judges. Moicano attempts a triangle choke for the latter half of the opening round with Tukhugov avoiding and showing impressive scrambling. Round 2 is faster and back-and-forth paced with both fighters staying on their feet throughout, Tukhugov the aggressor and Moicano maintaining center-control. Moicano’s cut under his left eye opens up early in the third but he ultimately lands the bigger shots throughout the final round and remains unbeaten (10-0-1) with a split decision victory.